This is my 1986 CJ7 that I have recently purchased. It has the stock 258 ci straight 6 engine, 4 speed and Dana 300 transfer case. My friend Kyle was the first to buy a jeep in 2008. After seeing his I wanted one, and in the last few months five of my friends now have CJ7's. I am now an avid fan of all Jeeps, and the history behind these vehicles. Larry's Comment: Thanks Chad for the better photo. 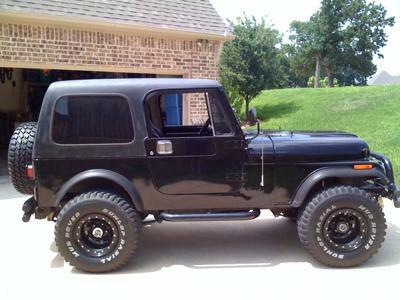 Even better looking CJ7 now! BTW..I deleted your previous submission and moved all of the info here. I had wanted a Jeep all my adult life. Finally at the ripe old age of 43 I finally bought one In June. A '92 YJ. I absolutely love it. Took it off road for the first time yesterday. Jeeps are great. I HAVE WANTED A JEEP MY ENTIRE LIFE. AT AGE 40, MY DREAM FINALLY CAME TRUE AND I AM THE OWNER OF A 1990 WRANGLER YJ ISLANDER. I BOUGHT IT FOR $3800, WITH A KNOCKING AND SMOKING ENGINE. SO WHAT, MY PLAN WAS TO BUY A JEEP AND PUT A NEW ENGINE IN HER, AND THAT'S EXACTLY WHAT I DID. A NEW (AT LEAST AS CLOSE TO FACTORY NEW AS YOU CAN GET) MACHINED BLOCK AND HEADS, NEW VALVES, NEW CRANKSHAFT, CAMSHAFT, PISTONS, BEARINGS, RINGS, YOU KNOW A COMPLETE OVERHAUL, THE 4.2L STRAIGHT 6 SET ME BACK $2500 WITH A ONE YEAR WARRANTY, I GOT $700 IN THE CARB, DON'T YOU LOVE IT, A VEHICLE BUILT IN 1990 WITH A CARB, (SCREW THAT FUEL INJECTION, WHO NEEDS IT, I CAN REBUILD A CARB MYSELF) HAS ANY OTHER MANUFACTURER DONE SUCH A THING? ANYWAY OWNING THIS JEEP IS ONE OF THE GREATEST EXPERIENCES I HAVE EVER HAD BECAUSE EVERY JEEP OWNER THAT I PASS ON THE STREET WAVES AT ME AND I WAVE BACK, TRULY AWESOME, LIKE A SAID, THE JEEP CULT!! DON'T YOU LOVE IT? I LOVE IT! TO MY JEEP I SAY SEMPER FI!